Under the terms of the discussions, Apple would expand the feature to veterans, creating special software tools that would allow the VA's estimated nine million veterans to transfer their records to the iPhone. According to The Wall Street Journal, top VA officials and associates from Trump's Mar-a-Lago Club discussed the project in emails that were obtained by the newspaper. The emails suggest the Trump administration "wrestled early on with the project's goals." Health records can be accessed in the Health app under the "Health Data" section. 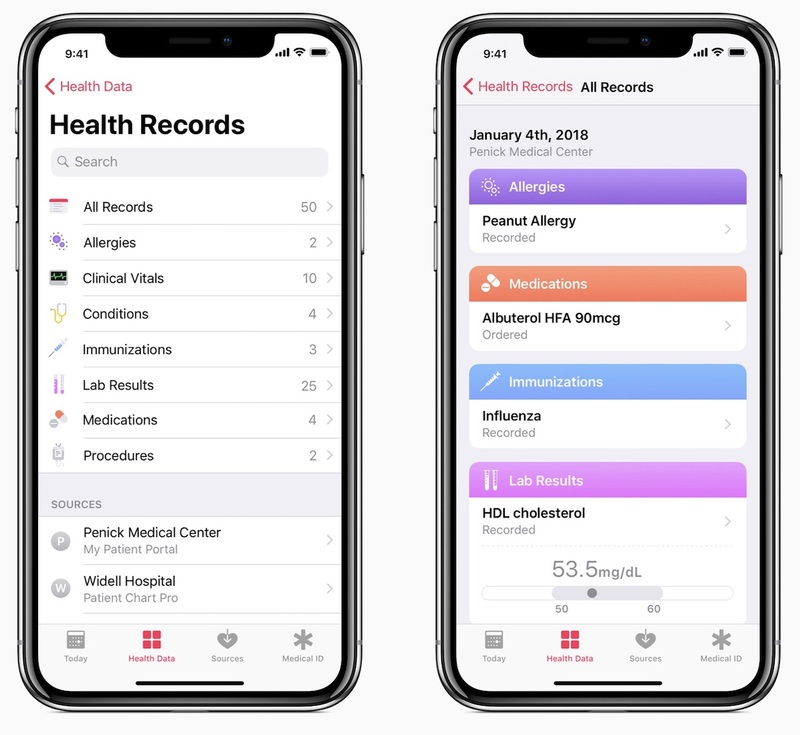 After choosing and authenticating with a provider, all relevant medical data is available through the Health app and is updated automatically following doctor visits. This is not a political post. Should not be posted here. The VA has typically VERY technology forward when it comes to electronic medical records. They manage and maintain one of the earliest electronic medical records known at this time. CPRS/ViSTA has been around since the 1970s and is actually quite effective. It has some aspects that are a little quirky, but what medical record doesn't? I would see the VA being willing and open to integrating with Apple. I would be quit thrilled to see an EMR solution like this available at the VA. Those who say "government hurrr durrr" don't have an understanding of the VA's ability to incorporate new technologies. They're a little slow, but they usually advance at a good pace. For instance, they have an electronic consent program that is miles ahead of the public and private institutions locally in my city. They also have a great 2 factor authentication system that is far and away the most secure implementation that I have used in my time as both a medical student and a resident physician. As great as this would be, the government will screw it up as always. Technology and government never seems to mix well. First why don’t they give veterans a big discount because most of them probably can’t afford alot of what Apple has to offer. I’m not a vet but my dad is and the only way they have iPhones are because we have purchased them for them. In all fairness government screws up everything it touches. If you idealistic anarchists had any idea how much of what exists today only exists because the big bad inept evil government grabbed the idea with one hand and pulled out its wallet with the other, you’d realize how absurd that ideology is. I don't know about all of the negative nancys out there with this. Guys this is a good thing, and they have got start somewhere. They also have the same integration with the Mayo Clinic as well. Hopefully soon most hospitals and doctors offices will start supporting this as well. -Apple Wallet will hold all of your credit, debit, and other passes. -Health will hold all of your health information and Medical ID cards. -ONE state in the US now has a digital driver's license, Louisiana, I know Arizona is getting it next. In most states, if not all, allow you to use your car insurance on your insurance company's app. -Something in the car to start the car, etc. -Many transit agencies offer apps to get on a bus/train. The idea is that this is the ONLY thing one would need to carry with you. It is a godsend out there for men who don't have purses to lug stuff around in. With all the data breaches the last thing I want is my medical data in any way available. I don’t want it electronic at all. Of course the whole purpose of electronic medical records is so the state can have easy access to it. It has never helped me. Doctors keep having me fill out the same long list of questions each time I go. Tin foil hats are available at your local Safeway/Vons/Albertsons. I think they're on sale. You can even use Apple Pay to buy them. I like Reynolds Wrap myself but store brand works too. If you idealistic anarchists had any idea how much of what exists today only exists only because the big bad inept evil government grabbed it with one hand and pulled out its wallet with the other, you’d realize how absurd that ideology is. People keep forgetting that there were a few things that the government did that really kind of helped out humanity as a whole, things like....THE INTERNET, and GPS. How about an accessibility mode in iOS for those veterans who suffer from Parkinson's disease, tremors and palsy? Fortunately my friend bought an iPad with a home button. He really struggles with various gestures needed for iOS.